Newseltter Popup Integration. Recently Viewed Products Bar Integration. Display as popup functionality. ABOUT THE MAGENTO 2 SOCIAL LOGIN FREE EXTENSION. We are constantly looking optimize user experience and conversion while reducing friction in the checkout process. Let’s start by identifying key login option issues that can get in the way. First, the process to create an account, login, and register can be too lengthy. Secondly, what happens when the customer forgets their password? Or even worse - struggles to remember the username or email associated with the account! This can feel hopeless and lead to an otherwise loyal customer abandoning the website entirely. Using a Magento social login module, or social sign-in, is a great way to simplify the login and registration process. This makes it so the customer does not need to remember their username or password. Because the social accounts are constantly signed on, it’s just a simple push of a login button. Quick access to their account results in reduced friction through the checkout process. 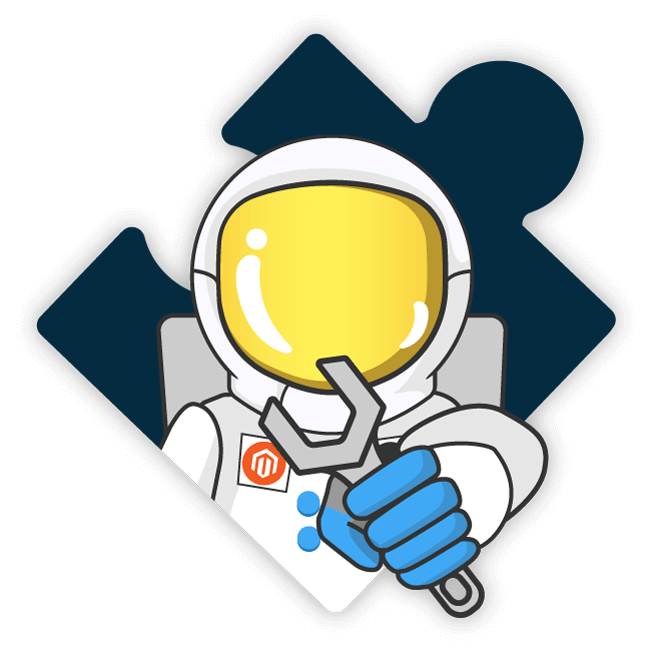 Try the Magento 2 Social Login Extension free today! RECENTLY VIEWED PRODUCTS BAR AND NEWSLETTER INTEGRATION. Integrate our Magento 2 Social Login Extension with our Recently Viewed Products Bar and Newsletter Popup extensions! We’ve ensured these functionalities work seamlessly together. Maximize account creation and the valid email newsletter subscription rate right from the moment your customers land on your website! These extensions work together to directly expand your customer base. Customers have an easier time creating an account while you’re capturing their valid email addresses. You can then instantly subscribe them to your newsletter list! Promote a stronger omnichannel experience by providing the customer easy access to their recently viewed products regardless of device or browser. Your customers are already using these popular social networks, so use it to your advantage! 86% of users report being bothered by having to create a new account on websites. 77% of users believe social login is a good registration solution and should be offered by all websites. 92% of users will leave a site instead of resetting or recovering login information. ⅓ of users admitting to leaving when they forget a password. 88% of users admit to entering incomplete or incorrect data on registration forms. 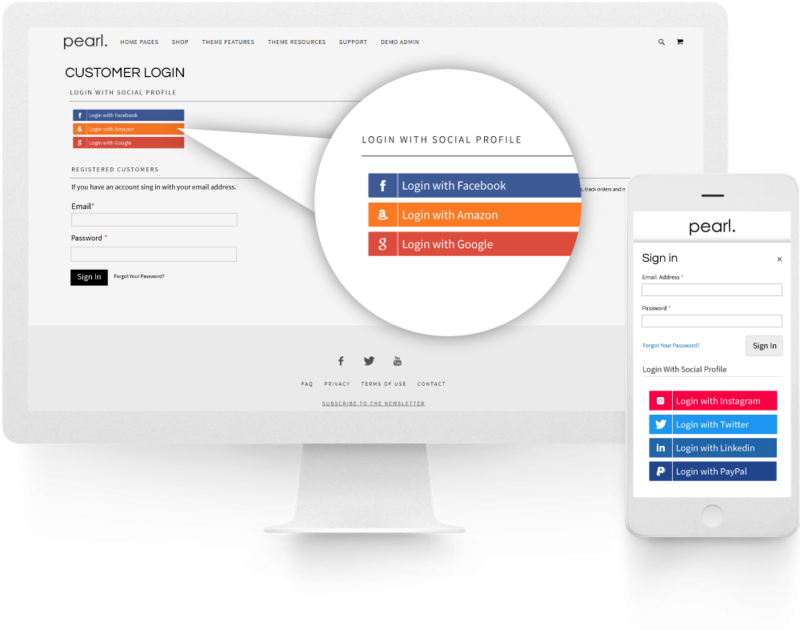 FEATURES OF THE MAGENTO 2 SOCIAL LOGIN EXTENSION. Magento 2 Recently Viewed Products Bar integration. The Social Login Analytics Dashboard helps you to better understand your user base. The Social Platform provides detailed reports that help analyze which social medias are most popular amongst your customers! This visibility into the networks your customers are using is a big help when strategizing where to invest effort and money into marketing. The Dashboard also conducts deeper analysis to help you take better decisions. Find out which customer demographic has the most orders, purchases the most items, or even generates the most revenue. All in one place! Our Social Login for Magento 2 has everything you need to optimize your store - and it’s free. What are you waiting for? Before installing Social Login for Magento 2 store please check the extension compatibility. This extension is currently compatible with the following Magento versions 2.0.X. - 2.3.1 It is recommended to install the extension first on a testing server before you install it on a live (production) server. Step 1. Remove extension code under app/code/WeltPixel/SocialLogin before adding the new extension files. The extension may be refactored and old unused files may cause random issues so it's best to only keep the latest version of the files.
! Important NOTE: Social Login only works with HTTPS connection, make sure your store is configured to use a secure connection. Go to Admin > Stores > Configuration > WeltPixel > Social Login > General Settings. Enable Social Login [Yes / No] - Enable/Disable the WeltPixel Social Login Extension. Show Social Login On Cart Page [Yes / No] - Choose whether or not to show Social Login buttons on the Cart page. Enable Facebook Login [Yes / No] - Enable/Disable Facebook Login. Facebook App ID and Facebook App Secret can be found when configuring the Facebook Login API by following the configuration steps below. OAuth Redirect URI - This URL should be used while creating a new Social Login application. Head to >>Facebook for Developers<< and log in with your Facebook account. Click on Add a New App and enter the app's Display Name, along with the contact email and click Create App ID. Find the Facebook Login product and click Set Up. Select Web as the platform, and follow the configuration steps presented. You'll see that Facebook Login has been added under Products. Click on it and select Settings from the dropdown menu. We'll be adding the OAuth Redirect URI, which we can find in the Magento Admin under WeltPixel -> Social Login -> Facebook Login -> OAuth Redirect URI. Finally, we'll get the App ID and App Secret. To do this, from the menu on the left hand side, select Settings, and from the dropdown, select Basic. Take the App ID and App Secret (you can also fill in the rest of the details on this page) and enter them into the Magento Admin under the respective fields. Set the App Status to Live. Save the configuration and you should be done! Enable Instagram Login [Yes / No] - Enable/Disable Instagram Login. Instagram Client ID and Client Secret - Can be found by following the configuration steps presented below. Head over to >>Instagram Developer<< and log in using your Instagram account. Click on Register a New Client and fill out the form. Under Valid redirect URIs, make sure you take the URI found in your Magento Admin -> WeltPixel -> Social Login -> Instagram Login -> OAuth Redirect URI and enter it into the field. After setting up the Client, it should appear in the Manage Clients list. On the next screen, you should be able to see your Client ID and Client Secret. Take the Client ID and Client Secret and enter them into the Magento Admin under the respective fields. Note! : In order for the Client to go live, you'll need to get it reviewed by Instagram. To submit the Client for review, hit Manage on your Client and head over to Permissions. After that, click on Start a Submission. Select "My app allows people to login with Instagram and share their own content". Describe what you'll be using the Client for and enter a URL showcasing the frontend with the Login With Instagram option enabled. You should then be ready to send in the submission. Enable Google Login [Yes / No] - Enable/Disable Google Login. Google Client ID and Google Client Secret - Can be found by following the configuration steps presented below. Head over to the >>Google Developer platform<< and sign in with your Google account. Click on Create Project and fill in the required details. Click on Credentials in the menu on the left hand side. Click on OAuth consent screen, fill in the required details and hit Save. Next, click on Create credentials and then on OAuth client ID. Select Web application and fill in the required details. Under Authorized redirect URIs, enter the URI found in Magento Admin -> WeltPixel -> Social Login -> Google Login -> OAuth Redirect URI. You'll then be presented with your Client ID and Client Secret. Copy those and paste them into their respective fields in the Magento Admin. Enable Amazon Login [Yes / No] - Enable/Disable Amazon Login. Amazon Client ID and Amazon Client Secret - Can be found by following the configuration steps presented below. Head over to the >>Amazon Developer Dashboard<< and log in using your Amazon account. Click on Register new application. Fill out the necessary details required by the form. Click on Show Secret to reveal your Client Secret. Enter the OAuth Redirect URI found in the Magento Admin -> WeltPixel -> Social Login -> Amazon Login -> OAuth Redirect URI under Allowed Return URLs. Copy your Client ID and Client Secret and paste them into their respective fields in the Magento Admin. Enable Twitter Login [Yes / No] - Enable/Disable Twitter Login. Twitter Client ID and Twitter Client Secret - Can be found by following the configuration steps presented below. Head over to the >>Twitter Developer Dashboard<< and log in using your Twitter account. Click on Create an app. Fill out the App fields. Fill in the Callback URL with the OAuth URL found in the Magento Admin under Admin > WeltPixel > Social Login > Twitter Login > OAuth Redirect URI. Click on Keys and Tokens. Get the API key and API secret key and enter them into their respective fields in the Magento Admin. Click on Permissions and make sure that you can see "Request email address" under Additional Permissions. Enable LinkedIn Login [Yes / No] - Enable/Disable LinkedIn Login. LinkedIn Client ID and LinkedIn Client Secret - Can be found by following the configuration steps presented below. Head over to the >>LinkedIn Developer Dashboard<< and log in using your LinkedIn account. Under Authentication, you'll have the Client ID and Client Secret. Enter those into their respective fields in the Magento Admin. Under Default Application Permissions, make sure you have the r_basicprofile and r_emailaddress boxes checked. Fill in the OAuth 2.0 redirect URL with the URI generated under Admin > WeltPixel > Social Login > LinkedIn Login > OAuth Redirect URI. Enable PayPal Login [Yes / No] - Enable/Disable PayPal Login. PayPal Client ID and PayPal Client Secret - Can be found by following the configuration steps presented below. Head over to the >>PayPal Developer Dashboard<< and log in using your PayPal account. Scroll down to REST API Apps and click on Create App. Note! : Live credentials are available only when using or upgrading to a Premier or Business account. You can find your Client ID and Client Secret in this next section. Copy them over into their respective fields in the Magento Admin. Click Save Config in Admin. Scroll down to the Return URL section. Add the OAuth Redirect URI found in Admin > WeltPixel > Social Login > PayPal Login > OAuth Redirect URI. Make sure you have the Log In with PayPal box checked. Click Advanced options and make sure you have Full name and Email address checked. Live mode troubleshooting: If you're receiving an error while your App is in Live mode, make sure the App allows the "Email" information to be requested. If the option is greyed out, you may need to submit your App for review. Fixed an error that was thrown when logging in with email address while Social Login was enabled. Fixed an issue on multistore environments with different Store Email addresses whereby the Welcome Email was always issued by the Default Store email address when a user registered with Social Login. Added new translatable text to module translation library. Fixed an issue in which Checkout could not be accessed when Guest Checkout Magento option was disabled. Fixed an error when accessing Social Login Accounts Admin tab while the store was in production mode. New functionality: popup login and sidebar login added to Pro version. New functionality: cart page social login option show/hide by default. New functionality: Integration with Newsletter Popup, Recently Viewed Bar for increased newsletter signup rate and increased conversion. Analytics dashboard optimization, now the analytics refresh is much faster. Login Form Key issue fix, when signing in with social login for the first time, you are not required to do this action twice. Social Media Google button updated in order to comply with Google requirements, previous icon design lead to rejecting your live mode application with the Google API. PayPal Sandbox and Live account configuration admin options. Optimized the generation of the OAuth URI in Admin. Fixed a bug related to Facebook Social Login return email function. You're reviewing:MAGENTO 2 SOCIAL LOGIN.